Moving to a new home can place tremendous stress on every member of the family, but especially on children. You can help reduce some of that stress by keeping the special needs of your children in mind at every step of the move. Here are a few ideas that can help make your move an adventure for the whole family. Tell your children about the move as soon as you can. The more time they have to think about it, the easier it will be for them. Try to view the move through your child’s eyes. What are their questions and concerns? What are they thinking? If possible, take your children to your new home before the move so they will be familiar on moving day. If you can’t visit, take pictures and videos so they can see where they will be living. Buy a map of the new town so children see their place in the community. On a new home visit, explore the neighborhood, go to the park, visit the library, go shopping and eat at a local restaurant. Try to find a sitter for infants or toddlers on moving day; it will keep them safe and out of the way. Help your child say good-bye to friends, teachers, ministers and other important people in their lives. Create a travel kit with crayons, markers, pictures to color and other activities. Let older children host a going-away party with friends and take lots of pictures. Help older children and teens collect addresses, phone numbers and e-mail addresses of friends so they can stay in touch. 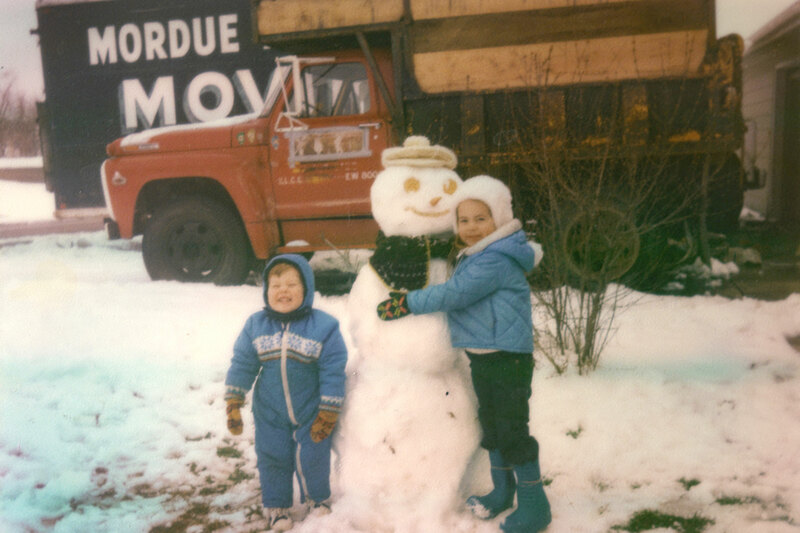 Josh and Amy with Mordue truck. 1982. Let the children watch some of their things being packed. Involve your kids in packing. Let them pack some of their own things, and then decorate the box with stickers, markers and crayons so they can easily find it. Don’t pack your child’s treasures. Keep out a favorite stuffed animal, favorite books or a comfort blanket. Try to line up some activities for your child to participate in soon after you move: sports, music, art classes and scouting. Be on the lookout for neighborhood kids. Encourage your child to bring new friends home so you can meet them. Let older children, especially teens, help choose colors, curtains and other decorations for their new room. Upon arrival, assemble the children’s rooms first, and then they can relax while the rest of the work continues.